Podoll also helped to honor two Coast Guard Auxiliarists for rescuing two paddlers who had fallen into the water and were at risk of being swept into harm’s way during a paddlesports event at Oswego Harbor in June 2014. Dale Currier of Oswego and Gene Little of Ithaca received the Division’s Operational Excellence Award. Currier is a member of Syracuse Flotilla 21. Little, who is with Ithaca Flotilla 22, was also named Auxiliarist of the Year for his collaborative work in fighting invasive species and in training the public and first responders in cold water survival. Commander Podoll referred to the rescue as one of the many services Coast Guard Auxiliarists perform. He also mentioned recreational boating safety classes, vessel exams, lake patrols, partnerships to stem the spread of invasive species, and search-and-rescue exercises. 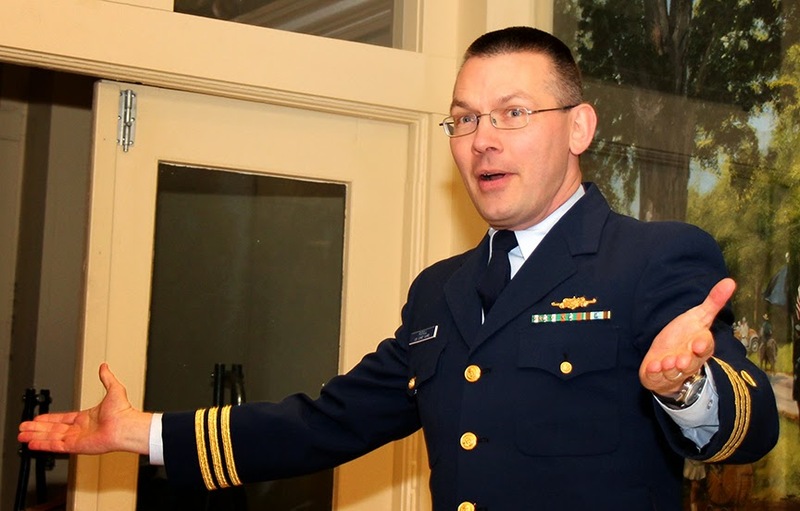 The commander, who served on a Coast Guard cutter in Alaska before being assigned to Cleveland, is director of the Auxiliary for the Ninth Coast Guard District. Also participating in the awards and swearing-in ceremonies were former Ninth District Eastern Region Commodore Nancy Rutiger and outgoing Division Commander John Conroy of Cazenovia. 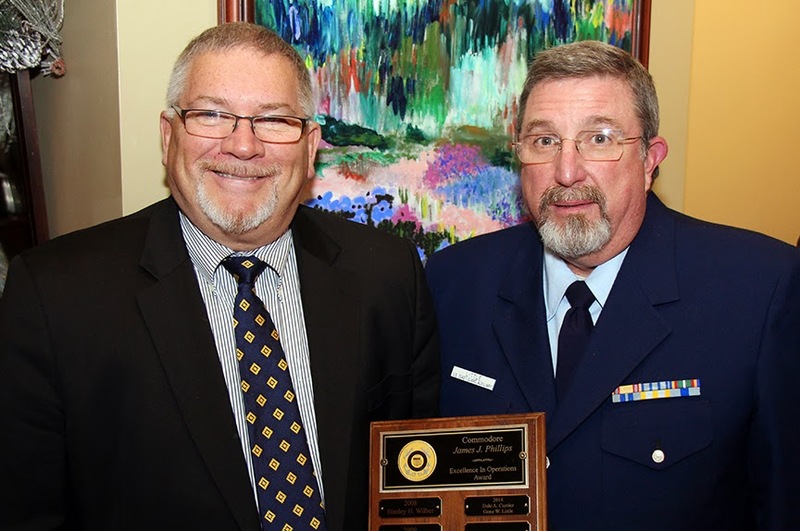 Syracuse Flotilla 21 was named Flotilla of the Year for its support of Coast Guard Station Oswego, Conroy said, along with its role in rescues and boating safety. 2015 Flotilla Commander Dan Garcia of Baldwinsville and Vice Flotilla Commander Dan Golley of Cicero accepted the award on behalf of flotilla members. Helen Cummings of Utica, a member of Sylvan Beach Flotilla 26, received the Division Commander’s Award for her accomplishments in the new role of diversity officer. Don Campbell of Lansing, a member of Ithaca Flotilla 22, received the Vice Division Commander’s Award for his behind-the-scene work, including serving as division finance officer. Kunz was previously vice division commander and before that was commander of Brewerton Flotilla 2-14. Born in Syracuse, he grew up in the Town of Cicero on the shore of Oneida Lake in the Maple Bay Area. After graduating from Cicero High School, he joined the U.S. Coast Guard, serving as a marine machinery technician at the Life Boat Station on Galloo Island on Lake Ontario and then as a small boat engineer at Station Oswego participating in search-and-rescue operations on Lake Ontario. After leaving the Coast Guard, he became a member of the South Bay Volunteer Fire Department in 1976 and served with the department until moving to Northern California in the autumn of 1980 where he worked in the auto industry for 24 years. After the 9-11 terrorist attacks, Kunz joined the Coast Guard Auxiliary in Alameda, CA. After returning to Central New York in 2003, he reconnected with the South Bay Volunteer Fire Department, working as an engineer and on water rescues, and linked up with the local Coast Guard Auxiliary Flotilla. He has been involved with working and training with the Auxiliary, Station Oswego and first responders from several fire departments on the west side of Oneida Lake. Kunz is a qualified boat crew member, instructor, vessel examiner and Auxiliary chef supporting Coast Guard Station Oswego. He is married to the former Theresa LaVergne.